Inspired by the natural design and shapes of the tropical parrotfish, these previously-rusty old boats now don bright new exteriors. The venture was another in a long line of community projects aimed to create “art as a tool for change” organized by the Madrid-based art collective Boa Mistura. 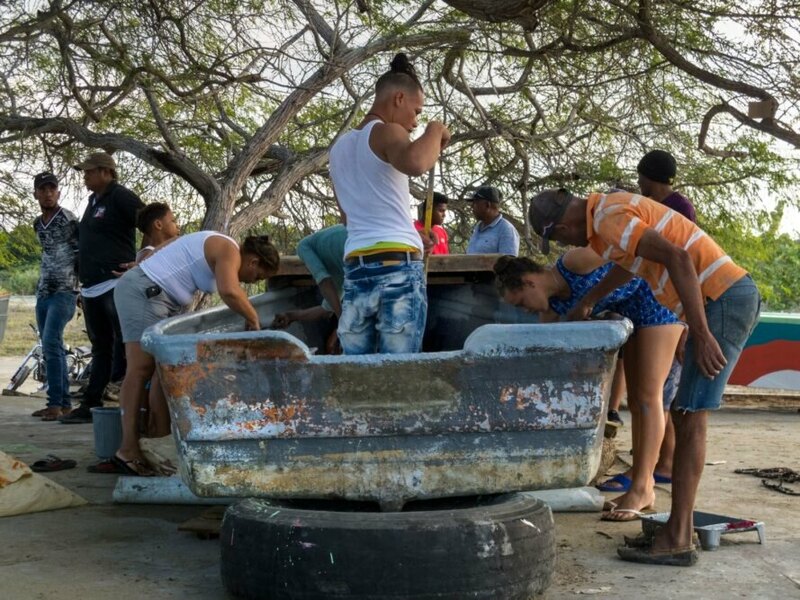 The Pepillo Salcedo village in the Dominican Republic has limited access to electricity and running water, and fishing is an essential facet of the economy and life. Boa Mistura, known for inspiring neighborhoods with its artwork, incorporated the community into the endeavor. 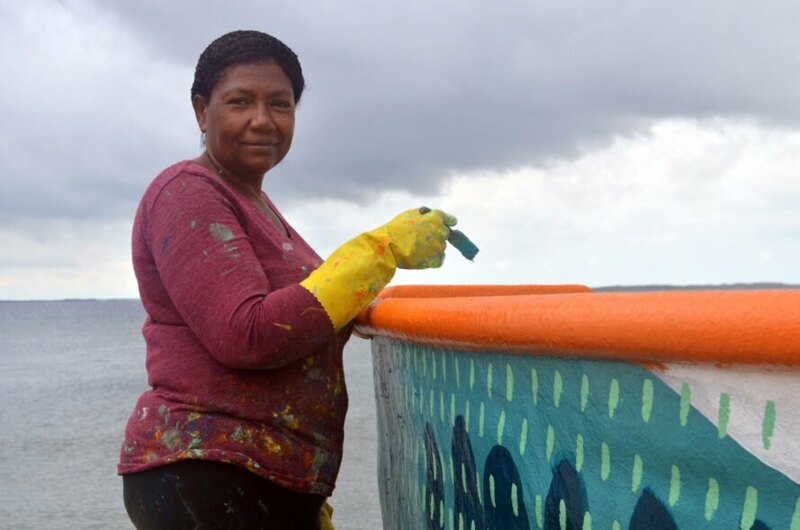 With the help of local fishermen and their families, 52 fishing boats were sanded down, removed of mollusks, repaired with fiberglass and painted with primer to prepare them for their colorful transformations. 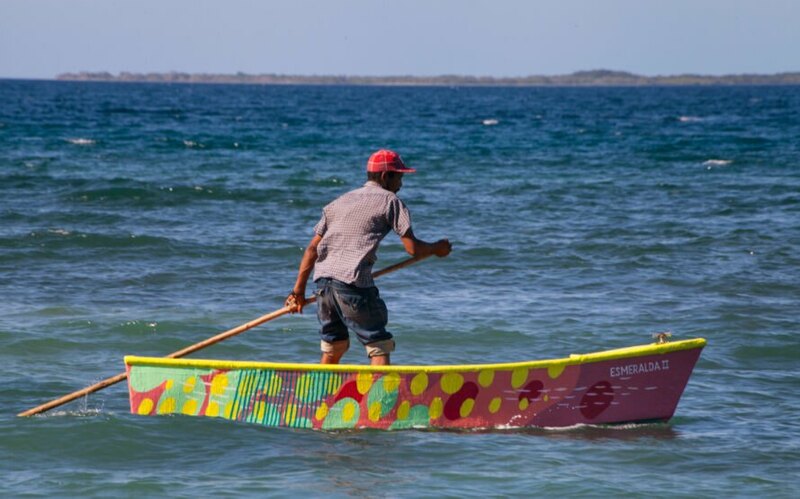 The fishermen of Pepillo Salcedo took to the project enthusiastically, some paddling for hours to reach Los Coquitos Beach, where their boats were to be painted. The utilization of the parrotfish conception was a mindful decision, as the animal holds a special significance in the tropical Caribbean region. The parrotfish feed off algae that collect onto the coral reefs, contributing to the cleanliness and therefore survival of the vital coral. What’s more, when the parrotfish eat the algae, it allows for the coral polyps (the soft, tiny organisms that help to form the structure of reefs) to become more resilient to other stressors, such as pollution or global warming. The fish feeds off of the coral itself as well, which is then turned into sand through the parrotfish’s digestive system and the animal’s tough teeth — some of the strongest teeth in the ocean, according to scientists. It is a fragile balance and relationship that benefits both the fish and the reef. A single parrotfish can produce hundreds of pounds worth of white sand in a single year, which means a substantial portion of the Caribbean beaches is made of parrotfish poop. Though the parrotfish is a protected species, intense illegal fishing has caused a devastating deterioration in both the fish population and the delicate harmony of the ecosystem. Needless to say, if the parrotfish numbers continue to decline, the region’s iconic white sand beaches and the colorful coral reefs will be in big trouble. 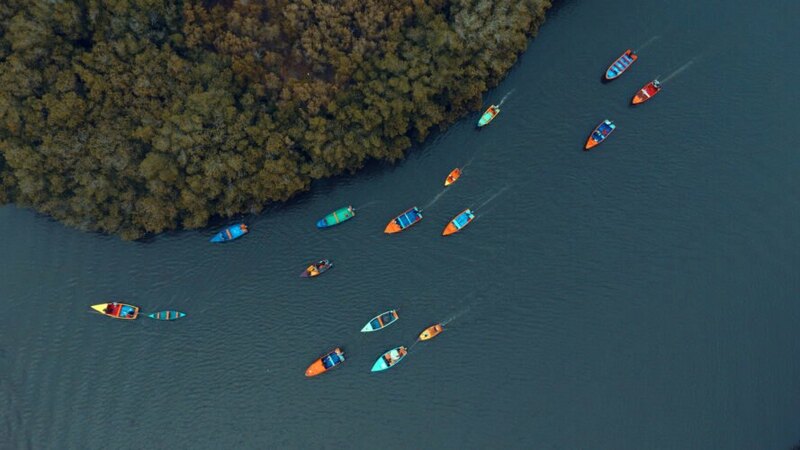 The entire project took about four weeks, and now the 52 yolas (the local term for these traditional fishing boats) that cruise the Bay of Manzanillo serve as a reminder for the respect and mindfulness required for the survival of the Caribbean parrotfish, white sand beaches and coral reefs. Boa Mistura has transformed 52 old boats into vibrant works of art. 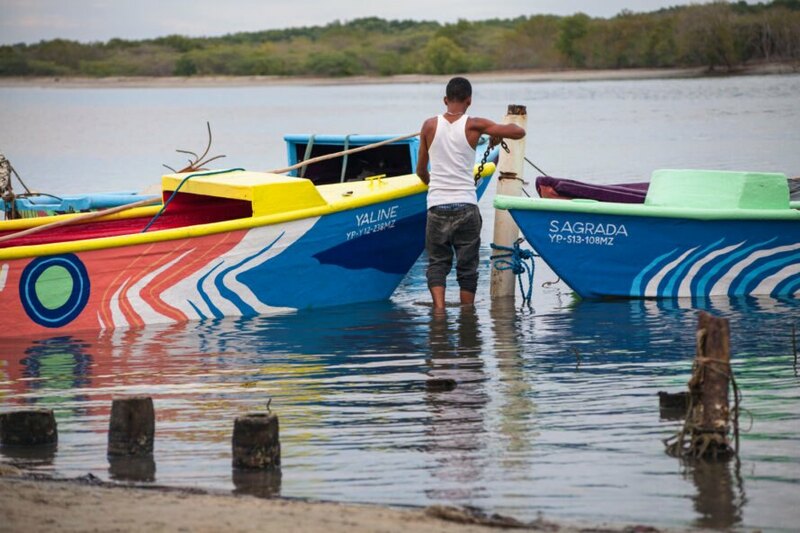 The boats mimic the colorful patterns of the region's parrotfish. The art collective Boa Mistura invited the community to get involved in the project. Some people traveled for hours to join in on the efforts. The project took about four weeks. Now, the boats bring awareness to the important role parrotfish play in the ecosystem.